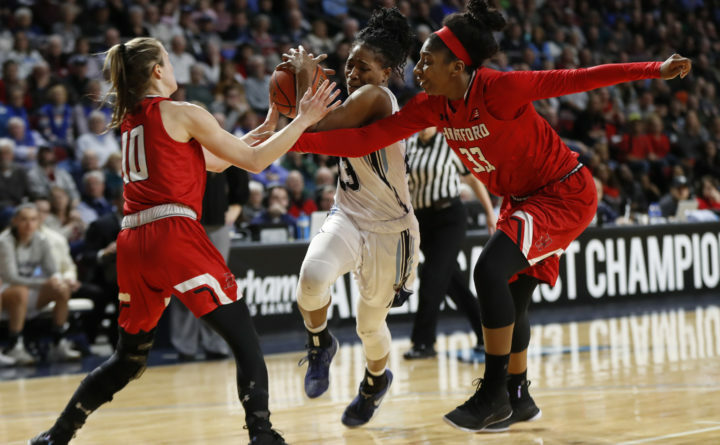 Maine's Tanesha Sutton drives to the net through Hartford defenders Mary Pattison, left, Janelle Harrison, in the America East Conference women's basketball championship, Friday, March 9, 2018, in Bangor, Maine. America East is going to a campus-based system. The America East women’s basketball tournament will be switching to campus sites for the first time in more than 20 years. All the games will be hosted by the highest seeded team next season. The format change was unanimously endorsed by the conference’s athletic directors in early April after being proposed by a women’s basketball working group comprised of head coaches, athletic directors and senior administrators. “This is an exciting time for women’s basketball in our conference,” America East Commissioner Amy Huchthausen said in a news release. “While we’ve had successful single-site championships in the past, including the last two years in Portland, this format has been widely successful on the men’s side for the last four years and will afford more of the campuses the chance to experience the thrill of postseason basketball and create great atmospheres. “It will also benefit our strongest teams and give them the best opportunity to advance to the NCAA Tournament with the highest seed possible,” she added. The last nine seasons have had the first two rounds of the America East women’s tourney being held at one site before the title game was held at the home court of the highest seeded survivor. For several years before that, the entire tournament was held at one site including the championship game. For the 2016-17 and 2017-18 seasons, the quarterfinals and semifinals were held at the Cross Insurance Arena in Portland before the championship game was hosted by the highest-seeded finalist. Albany beat visiting UMaine in the 2016-17 title game and UMaine topped Hartford in this past season’s championship game at the Cross Insurance Center in Bangor. The league has also eliminated the play-in game between the eighth and ninth seeds for the final playoff spot and a quarterfinal berth against the top seed. The team that finishes last won’t be included in the tourney. Next season, in the quarterfinals, it will be the top seed entertaining the eighth seed, two hosting seven, three awaiting six and four home vs. the fifth seed. Sean Tainsh, the director of communications for America East, said it has yet to be determined if the league will reseed after the quarterfinals to have the highest seeded winner hosting the lowest seeded survivor in one semifinal and the middle seeds squaring off in the other. That is what happens in the America East men’s tournament, which just finished its fourth season of having all the games at campus sites after 19 seasons playing the preliminary rounds at one site. But for the women’s tournament, league administrators could opt to have a predetermined bracket with the winner of the 1-8 game taking on the 4-5 survivor and the 2-7 and 3-6 winners facing off in the semis. Vachon has mixed emotions about the format change. UMaine won all four of its tournament games in Portland. But Vachon also pointed out that the Black Bears were nearly on the short end of the stick during the 2014-15 season when the tournament was held at Binghamton. UMaine was the top seed and had to face eighth seed Binghamton in the quarterfinals. UMaine survived a scare from Binghamton, winning 78-71, but got upset in the semifinals by Hartford. “There are pros and cons to everything,” said Vachon. “We’re getting rid of the tournament feel but we’re rewarding teams for their regular season performance which is always good as well. “If we have a great season, we’ll have more home games so our fans will have more chances to watch us play,” added Vachon whose Black Bears beat Hartford 74-65 in front of 3,373 energetic and vociferous fans at the Cross Insurance Center in the title game on March 9. “If you don’t have a good regular season, you’re going to going on the road. So as much as our regular season conference games counted before, they will count even more now,” Vachon said. The Cross Insurance Center in Bangor hosts Classes B, C and D North boys and girls basketball tournaments and holds either two or four state championship games every year so adding potential America East tournament games there will have to be negotiated by UMaine and Cross Insurance Center administrators. “We’ve had to do that anyway for our regular season games,” said Vachon. She noted that the new format could also be beneficial financially for the league. “It cost a lot more to hold it in one spot. That’s a huge piece as well,” added Vachon.